We’ve had so much fun meeting so many wonderful families who have children born with Down syndrome. Many of these families have a blog where they share their story, and we want to showcase some of those blogs here. If you have a blog about your child with Down syndrome please fill out the form at the bottom of the list and let us know about it! Be updated at least once a month. We look forward to seeing your blog on the list! (By the way, it would be awesome if you would include a link back to our blog on your site. It’s not required to be included on the list, but we would appreciate it!) All you have to do to add our button to your blog is copy and paste the code at the bottom of our sidebar! Thanks! Follow Tessa as she grows and read her mommma’s monthly letter to her! Â Also, get a parent’s perspective on raising a child with a little something extra special! Nick’s world… The rest of us are just trying to keep up. That includes how he likes to get our goat including the 26 fire alarm pulls since third grade. Beyond this Nick is a cool, funny guy who takes great pride in his work and making you smile. Oh and he has autism too. Life with Leo is shown through the eyes of a mom, a dad who is a teacher and musician, a teenage sister, and toddler brother. Struggling with infertility, our family forever changed after our first IVF cycle. Half way through our miracle pregnancy, we received a prenatal diagnosis of Down syndrome. Eli is our biggest blessing and we have been enhanced by him! Follow our journey: life, crafting, family. Up–the–down–staircase shares our experience of raising a little boy with Down syndrome and how truly blessed we are. Felix arrived, with a little something extra, and has completed our family so perfectly. My blog is about the joys of raising a child with Down Syndrome, and a few mentions of his 7 amazing siblings as well. The day our daughter Kiki was born, her unexpected diagnosis changed our world forever. Follow our family as we find joy in learning through life’s beauty, bumps, and bruises. Our great adventure of raising our daughter with Down’s has just begun… Can’t wait to experience all the joy and love she will bring this world! A story about my amazing son and how he has changed our family for the better. The blog charts our son’s development, the impact of Down Syndrome on a sibling. It’s a mothers perspective – honest and simple. In September 2011 we changed from just a boring, typical parents to the exciting life of Â parents of a child with Down Syndrome. This blog is about our lives with our Wee Pie, Grayson, who was diagnosed with Down Syndrome at birth. And his typically developing older sister, Marloe, who is only 15 months older than him. Times are good, but boy are they hectic! An upbeat blog from Brazil, about raising a special needs baby, with warm stories and cool tips. Follow our journey through newlywed life, medical school, and pregnancy/parenthood. Â Our daughter’s extra chromosome makes us extra excited to meet her! Our Dream Come True is the title of our blog, but also the title of our life. Every day I have the opportunity to love and be loved by the Lord, my handsome husband, and my sweet Baby Baker. Our journey is not perfect, or glamorous, but it’s ours and it’s a dream come true. Ben is 4 and the youngest boy at our house. He works hard to try to keep up with his brothers, despite his diagnosis of Down syndrome. He loves to play sports, learn, sign and has been reading sight words since age two. We hope our blog can inspire others to that kids with Down syndrome can accomplish amazing things! When I received Regan’s diagnosis 8 months ago I found comfort and strength in Down syndrome blogs, and read them until I couldn’t look at a computer any longer. Now that I have come to terms, and accepted this diagnosis, I wanted to Pay It Forward, if you will – attempt to help another family that may receive this diagnosis. Having a child with Down syndrome has been an epiphany. Â It has been a journey of transformation in which we have learned things we needed to know about ourselves, others, and the bond that connects us all. Â It is with gratitude that I am compelled to share our metamorphasis in the hopes that somewhere there will be others who also can “slip the surly bonds of earth and touch the face of God”. My blog tells Noah’s story and his development. Â I try to focus on information that expecting mothers may be interested in if they get a prenatal diagnosis for their child. I’m Tom, a UK based thirty-something father to three beautiful children and husband to my soul mate Karen. I started this blog as a means to talk about stuff, get things out in the open, a bit like an online therapy I guess and to celebrate the progress of my beautiful daughter Rosie who was born in March 2011 with Down’s Syndrome (DS) and a Complete Atrioventricular Septal Defect (AVSD). Studies show that approximately 90% of women who receive a prenatal diagnosis of Down Syndrome choose to end their pregnancy. Our child is one of the lucky ten percent to be born. We want the world to know the blessing of raising a child with Down Syndrome. Then perhaps they will see that we are the lucky ten percent! Not specifically about Down syndrome, but more about someone with Down syndrome, his passion for photography and his capabilities rather than his challenges. Shortly the blog will be featuring other young adults with DS who love photography, with links to their own work. I am a mom on a mission to share our story and educate others about our unique family. Â Our journey includes sweet Brinkley, our blessing with a little something extra, and Reese, our bi-racial son adopted from foster care. Patrick and his brothers is a blog about raising a beautiful little boy with that extra chromosome along with his four older brothers. Parenting any child is hard work and we have to try to find joy in every moment, even the hard ones. Greetings from Malaysia! I’m sharing the journey of our 3rd child, baby Iyad who was diagnosed to have Mosaic Down Syndrome at birth. We are very much blessed with his presence and will give our best to help him reach his maximum potential. We wanted to share how joyful our life has been with Monica. We’ve added a contemporaneous posting for each year of her 20 years so far and plan to keep it going. This blog is somewhat unique because it has our musings over 20 years, not a look back, but how we felt (always joyful) and captured our feelings at that time. We also have a 20-year photo journal that captures her development into a young lady. This is the story of a dad’s relationship, told through illustrated stories, with a newborn diagnosed at birth with Downs Syndrome. Introducing the world to Mini, a cool little chick with down syndrome for who the sky’s the limit.Like any family,we have ups and downs,tears and laughter but this is life and we are living it. Tough Little Boys is dedicated to my sons Ethan and Elijah. Ethan was born with Down syndrome. We had a prenatal diagnosis. I blog to share what our life is like so other families feel at ease as they recently received diagnosis, treatments, or surgeries. I advocate and educate for my son and our family! We’re a family living in the moment and dreaming of the future. Our son, Sam, was born in May 2012 with Down syndrome. We thought that might change our dream of living in East Africa, but God has called us to this path & our children are a big part of that calling. We’re currently in Kenya, preparing to move here full-time in two years. My blog is an honest to goodness look at life…sometimes silly and sappy, sometimes scary, but always spontaneous. Josh having Down Syndrome is just a little part of our lives, but that little part has made a lasting (and large) impression on my life and the lives of others. My stories aren’t only about Down Syndrome, but God does use it quite frequently to teach me His ways. We are blessed! Have a site about Down Syndrome? Fill out the form below and let us know! Hello! My name is Jen!!! This month Terpening Insurance is celebrating Special Needs Awareness Month!!! In order to celebrate all of the uniqueness and to further raise awareness we are composing an article! I am really quite thrilled to have discovered you in this process, I really respect all that you are passionate about and your website, does a very powerful job showcasing that!!! I adore how your voice really shines through and I would love to hear it ring in my article as well! On a personal note my sister is celebrating her 13th year of being a Special Olympian- hence why this article means so very much to me!!! I think we can really create something beautiful here. If you are interested in participating please contact me for additional information! Asking questions are really pleasant thing if you are not understanding anything totally, however this piece of writing provides pleasant understanding even. excellent submit, very informative. I’m wondering why the other specialists of this sector don’t notice this. You should proceed your writing. I’m confident, you have a great readers’ base already! I wanted to share a great story that my wife’s niece wrote and one that has touched a lot of lives of parents with a Down Syndrome child. Her name is Megan Abner and she wrote a book called “Up Syndrome, It’s all about the attitude”. It’s an autobiographical account of living with Down Syndrome. It’s written in her own words and she shares some great stories of her journey, as she puts it, turning a “disability” into a “different ability”. (She is now 31). It’s currently listed on Amazon. Hope you have an opportunity to read her story. 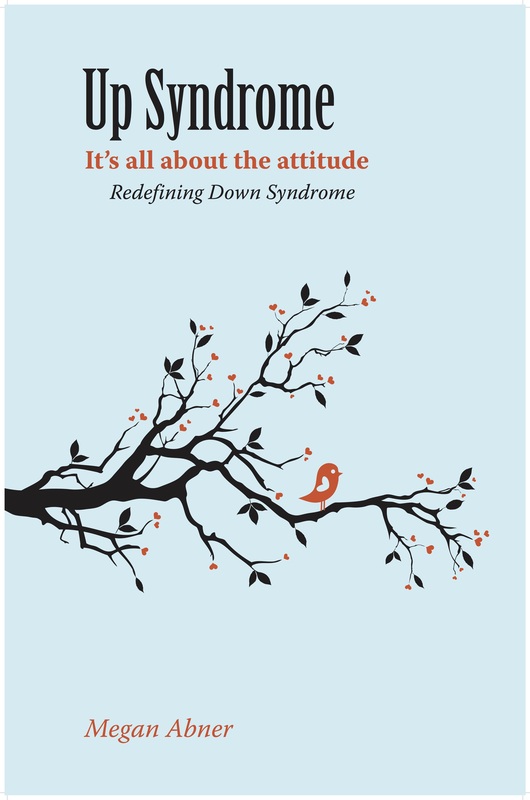 As I look through the great blogs from parents of little ones with Down syndrome, I can’t help be encouraged and genuinely happy for all the positive changes that have taken place (more acceptance, inclusion, services) since my daughter was born 21 years ago. No doubt, your little ones, as they progress through the school systems (or homeschool journeys) will be better than the self contained classrooms my daughter was in (the best options at the time). But the question that Debbie raised is a valid one that in my own searching, I’ve discovered is a definite gap in the world of blogs and on-line information pertaining to our love ones with Down syndrome. Although in it’s infancy, I’ve started a blog for parents of young adult children with Down syndrome. What does the future hold for our children? Jobs are very hard to find. Housing: what’s the best option? What services are available to address the needs of our young adults? What policies and laws are currently up for review that will affect them? What creative and unique things are parents doing to help their young adults find jobs? How do you handle a young adult who doesn’t want to work? The blog will also cover our family’s journey as we navigate these years with our own daughter. I’d love for you to check it out and leave your comments! I would love some advice on getting my son who is 14 to like school? He HATES it, no matter where he goes. He’s always stuck in a self contained classroom even though they try to make it sound as if he’s not. He goes to public middle school until next year starting 9th, he’s excited about being a high schooler but he’s still gonna fuss about going!!!! Many individuals with down-syndrome grow up to hold jobs, live independently, and enjoy normal recreational activities. These people have found the confidence from within to become the best representation of themselves. There is a website, glpbrand.com, which features many individuals, such as Ana, a fitness model with down-syndrome and Dave, a down-syndrome bowler as examples of what people are capable of. To help spread the awareness of the campaign, I’ve been involved in the release of shirts that support the cause and create funds to aid in Giving Hearts’ growth as a foundation. I’d be eternally grateful if you could help us spread the word. A social share, a blog shout-shout, anything—would really help outreach. The story of Alex and Addie as well as the #InclusionMatters campaign live here: http://www.iheartgarments.com/campaign/inclusion-matters. If you’re interested and need anything else, please let me know. I have a nephew who was born on 11-29-13 with Down syndrome. My sister in law afterwards was panicked that she did something wrong. She was surprised at 37 to find that she was pregnant but besides being a little over weights she was healthy. It was very sad to hear from my brother-in-laws girlfriend at the time announce to us all that Downs was a product of drug abuse. She did not know my husbands sister very well but drug use was not something she participated in, ever actually. But this girlfriend worked in a hospital in the insurance office. She told all of us despite a text message from me explaining there is no evidence any drug use causes Downs(even though I know my husband’s sister did not participate in any drug activity but that is beside the point) that this happened to our Jayce BC his parent done drugs. I disputed this continuously but she told us (this is a little hard to believe I know BC I could hardly believe it myself!) she could get a doctor from Dardanelle Hospital in Dardanelle, AR to sign a statement saying Down Syndrome was caused by drug use. This girl amazingly has tried to say these unfortunate things about my sister-in-law and nephew. It’s so unfortunate to anyone who has a loved one with this birth defect to have to put up with someone so ignorant as Erika Susanne Orrell. Someone who likes to pass herself off as a medical professional. Feel free to call her at (501) 209-0333 and enlighten her to the truth. As I can’t seem to convince her since she has “medical doctors will to sign stating drugs cause Downs Syndrome”. I’d like to be added on your list of blogs. My experiences with Alex, my boy worth Down syndrome, have been a life changing experience. My posts are honest and Informative and sometimes downright funny. We have an amazing journey to share! Please allow me to introduce myself. My name is Cherrick Gordon and I am a pediatric physical therapist. I have a number of years experience working with infants and toddlers with Down Syndrome. I recently started a newsletter to share my knowledge about the importance of early movement and it’s impact on development and learning later on in life. This newsletter also provides parents of young children with actionable advice, exercises, and techniques they can use to help their babies get off to the right start. I believe that an early start in the development of gross motor skills impacts everything that comes later. Please share this with anyone who you feel would benefit from such knowledge. Here is a link to opt in to receive the newsletter. A post from my son’s FB page Averett’s Journey. I want to do a blog in the future… but life is blur right now and a FB page is how I update. This is a post from 2014 when I started his FB page… when it was all very new and life was still a whir of what do we do now? How will we do it? I am by far still learning and growing with him…. but with the support of others, we are doing well. “So where do I start? How does a person begin the telling of someone’s life journey? I guess I should have thought to begin this page when Averett was still in my belly… but alas, in true Shauna fashion… I did not. Life gets away from us sometimes….and until we take a moment to slow down and savor it…. it passes us by and we miss so much. I am guilty of this more times than I can count, but I can say with affirmity that since Averett’s birth, I have done this much less. I have learned to slow down and smell the roses so to speak, to take things as they come and to be grateful for life’s little things. This little 15 lb body has taught me more in his 6 months of life than I have learned in my 35 years. I love every single inch of this little boy and wouldn’t trade a hair on his head for the world. This is not to say I don’t cry and lament over his diagnosis of Down Syndrome, we take every day …. one day at a time. We have to or we would go insane with the ‘what ifs’ , ‘should have’s’ and the ‘could be’s’. I will try to recapture the past events and bring the page up to date and track the here and now’s. I owe this to my little Averett…. I owe it to him to at least share his story and do my part to bring awareness to my little portion of the world…. he has enriched my life…. and my families lives, so much! Thank you for taking this journey with us. This is how I shout awareness, cope, connect with others, find solace, and come to grips with DS and all of its parts. Thanks for compiling all of these blogs! I was so encouraged about learning about down syndrome and how an child cam do it .I was so impressed seeing Noah and as he is growing with skills as compared to other children in his age .Please do post more about Noah as its an inspiration. I had my baby boy at 33 +5 after my water broke 5 weeks earlier. The doctors always told me that there was a chance that he would be born with T21. I am 24 years old and healthy. I was devastated. He also had an unbalanced AVSD and hypothyroidism and pulmonary hypertension and was very sick the first 3 months of his life. However after bringing home and having spent time with him, I became certain that this child was the best gift I could ever ask for. He was full of life and laughter. He changed my world and I am not just saying that. I used to read blogs that are saying exaclty that and I remember thinking that there is no way they are actually happy but today I am not only happy but grateful that i was blessed with this angel. You might have noticed I am talking about him in the past tense and the reason for that is that he passed away a few days ago. I felt numb and broken and i know that whatever children i may have in the future will never be half as amazing as he was. But he was suffering due to failed surgeries he had and was very heavily sedated and had auffered a stroke which paralyzed him. I am certain that he is in a better place. For all the parents who were told that your baby has T21, i promise they will be spectacular and will change your lives completely.